Thirty weeks, guys. Thirty straight weeks of sticking with something. We should celebrate. With green beer. Any takers? I had a slew of ideas for this week’s subject but did none of them. Didn’t even try. Actually, I didn’t even pick up the camera at all this weekend. Not in the mood. But Monday had decent weather, so I took myself on a quick walk around the block at work. There’s really only one reason why I don’t like working on East Main Street: the lunch pickens are slim. Sure, Subway and Jimmy Johns are close but a girl can only take so many sandwiches. 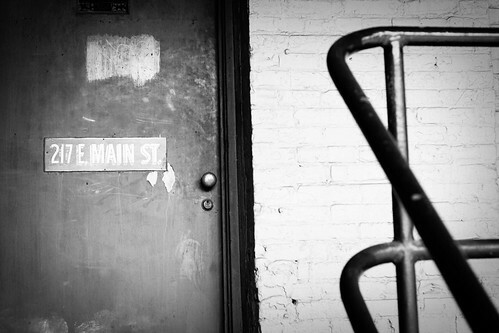 But the nice thing about East Main Street are the buildings. The old crappy buildings with flaking paint that smell funny if you get to close. The buildings are more industrial, not as well taken, some are even abandoned which means that it’s more interesting [and I mentioned smelly, right?]. Well, [interesting] to me at least. Don’t get me wrong, I like trying to get fun shots of the Humana building or the Kentucky Center for the arts but they’re so… so… clean. And crowded. Do I make any sense at all? OK, whatever – just ignore me and go check out the flickr pool’s photos or click on the challenger roll. Next week’s subject is “reflection”. And I have no flippin’ idea what I’m going to do. At all. None. The suspense is killing me. 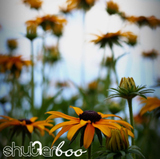 ~ by shutterboo on March 17, 2010.
interesting texture in this picture!! I really like this one, B! I’ve been missing in action, I know. I’m still trying to get healthy, my old body can only handle so many things at a time. Looks to me like you’ve been cooking up a storm! Hope all is well and keep the dishes coming! This is so cool. I love it. And I totally get the old, funny smelling building thing. Old, funny smelling things always seem to have so much more character. (Ok, that’s just weird). Anyway, love it!! Jimmy Johns is a chain sandwich shop. I never saw one until I lived in Indiana; when we moved back, there they were. Wow, very different indeed! If you ever get to the Philadelphia area, you HAVE to take a side trip to our Jimmy Johns. It’s worth the trip, I promise! I’ll have to look for your Jimmy Johns if I ever get out of my area; it looks tasty.